Welcome to “Bites from the Editor” the first of many new features you will be seeing on Jersey Bites in the days ahead. It occurred to me last month as I was interviewing new writers and editing all the new posts from Editors all over the state, that our readers might be getting a little confused, or at least curious, as to what is going on behind the scenes at Jersey Bites. So, on the first of every month, you will be hearing from yours truly with an update on what’s new and what’s coming up for the month on Jersey Bites. In April, we welcomed some wonderful new talent to the writing team. Allison Heller who writes for the Examiner.com and Trendhunter.com will be covering all things yummy in Cape May County. Rachel Bozek, a 12 year veteran from Nickelodeon Magazine, Ysolt Usigan, Beauty and Style Editor for iVillage and Tracy Goldenberg, our “Living Green” expert will be writing about what’s happening in Essex County. Beth Christian and Jennifer Ellis May will be your new Burlington County connections. You can read more about our growing list of Editors on our new Team Page. We have our first male contributors. Phil Sikora, who will be writing our new “Reviews from the Road” series. Follow Phil as he follows the road to the best pizza joints, hot dog stands and diners. Phil’s first piece on Pizza Town in Elmwood Park is a great read if you missed it in April. Tom Kovacevich, from TMK Produce will be giving us monthly updates on what’s in season in New Jersey and where to find it. His first post will give all of us some great tips on sources for vegetable plants in New Jersey. We will be introducing a new feature that I am particularly excited about called “This is New Jersey.” The idea behind “This is New Jersey” came after a conversation I had with our Hunterdon/Mercer County Editor, Robin Damstra. Robin was casually telling me how she never buys eggs from a store. 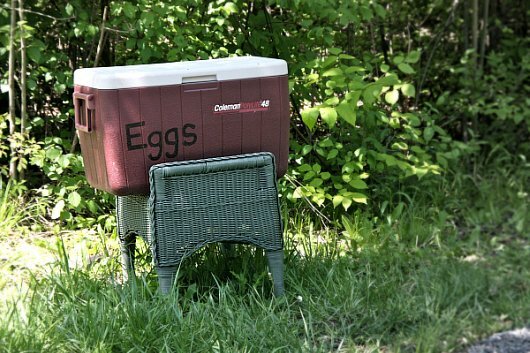 All of her neighbors have chickens and they put the eggs for sale in coolers at the end of their driveways. I just loved this little “way of life” piece of New Jersey that I had no idea existed and it got me thinking. We all have our own pieces of New Jersey that we probably take for granted. Growing up on the Jersey Coast, (yes, I am a REAL Jersey Shore girl) the daily images I take for granted like the Lobster boats a block from my house or the fisherman heading out to sea in the wee hours of the morning, may not be a familiar image to many of you. Our intentions for “This is New Jersey” is to bring you images of New Jersey lifestyles that may be new to you or at least a reminder of all that our wonderful state has to offer. We welcome submissions from photographers and amateur photographers, so please send us your photos. And, hey, if “This is New Jersey” helps to dispel some of the notions fabricated by that ridiculous “jersey shore” show, all the better. You don’t get any more Jersey Shore than me and I don’t tease my hair or fake tan. I rarely even wear nail polish. Our high school has a surfing team and our school mascot is The Gulls. (watch out, we’ll steal your french fries.) So, yes, you can imagine I’m passionate about portraying the REAL, Jersey Shore and all of New Jersey. I’m really looking forward to “This is New Jersey” and I hope you enjoy it too. As you can see, things are starting to get very busy here and we know you are busy too. That is why we have set up new subscription options to deliver the information you are interested in. If your interests lie solely in the news for your county, you can subscribe to receive emails on the county page of your choice. If recipes are your gig, just click on the recipes tab at the top of the page and use the subscription box located on that page. If you love everything we do from soup to nuts use the main subscription box on the home page for “Your Daily Bite” updates. If your county has yet to be added to our line up, have no fear. We will be adding new Editors for each county as the year unfolds. We are always looking for talented writers, so if you or someone you know is passionate about food and would like to write for Jersey Bites, please get in touch. Coming up this month! Get ready for some tips on where to take Mom for Brunch or Dinner on Mother’s Day, some wonderful spring recipes, planting tips and an update on Farmer’s Markets in your area and of course more restaurant high lights and food events in your area. Now get out and enjoy this glorious spring day. Founder and Managing Editor of JerseyBites.com.